1979 Iran: Hours before the fall of the Pahlavi dynasty, eight American-trained SAVAK intelligence officers defect to the United States carrying with them a secret that could one day propel Iran to the rank of superpower. 2018 United States: When another series of peace talks over Iran's nuclear program fails and a rogue Iranian general flees to Greece to meet with a high-ranking CIA officer, the Iranian Supreme Leader -- who's determined to redraw the map of the Middle East -- orders the execution of an operation decades in the making. Within hours, key elements inside the American and Canadian governments are wiped out. With the stock market in turmoil and evidence showing that the attacks came from within, Mike Walton and his team -- all covert counterterrorism assets working for the International Market Stabilization Institute -- have seventy-two hours to find the traitors before the White House orders a massive retaliatory strike that would annihilate any chance of peace in the Middle East. From the tourist-filled streets of Athens to the high-rises of New York City, Mike Walton will need to cross the line he swore he'd never go over in order to protect the ones he loves. Never have the stakes been higher or the odds against him been so great. With his sanity on the line, and the lives of thousands resting on his shoulders, Mike will do what he must . . . one bullet at a time. RAVES FOR SIMON GERVAIS: "When Simon Gervais writes about the world of high-stakes global security, he knows what he's talking about. 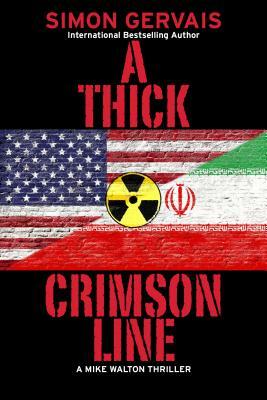 His world-class security expertise shines through in THE THIN BLACK LINE, a high-speed, break-neck, turbo-charged thriller that takes readers behind the scenes of the war on terrorism." - David Morell, New York Times bestselling author "THE THIN BLACK LINE is a refreshingly smart and blisteringly original tale that's equal parts financial thriller and cat-and-mouse game with the survival of the United States economy hanging in the balance. Simon Gervais puts his own law enforcement background to solid use in hitting a home run his first time at the plate. A major debut that places him on the level of Nelson DeMille and Brad Thor." - Jon Land, bestselling author of STRONG VENGEANCE "A RED DOTTED LINE reminds us of what thrillers are supposed to be: thrilling. Gervais, a former anti-terrorist agent, knows the world that he writes about and illuminates the dark threats we all face on the global stage. A RED DOTTED LINE will entertain, educate, and engage even the most jaded reader of international thrillers." - Nelson DeMille, New York Times bestselling author "A RED DOTTED LINE is a taut and intelligent thriller chock full of excitement and authenticity. Simon Gervais shows off an expansive range of knowledge and an equally remarkable ability to keep a complex story moving along at a breakneck pace. The plotting is first rate, and the wide cast of standout characters memorable. Readers will find A RED DOTTED LINE reminiscent of the very best of Vince Flynn and David Baldacci." - Mark Greaney, New York Times bestselling author.